Poor Economics | Fourth Dimension Inc.
“Given that economic growth requires manpower and brainpower, it seems plausible, however, that whenever that spark occurs, it is more likely to catch fire if women and men are properly educated, well fed, and healthy, and if citizens feel secure and confident enough to invest in their children, and to let them leave home to get the new jobs in the city. A system of education which provides the basic skills to earn a decent living with a close monitoring assessment and improvement of the process of education and its results to ensure the desired outcomes are actually realized. Providing basic and affordable nutrition which lays down a strong foundation of health in people. Simple, low-cost and effective innovations like microcredit which can break the vicious circle of poverty and kick- start a reverse cycle of progressive improvement in the living conditions of the poor; iodized salt which can improve their health: electronic money- transfer through mobile which can enhance their financial capabilities. Another unique feature of the book is that ideas and theories are supported by authentic empirical data and research. For example, the authors cite the following research surveys to illustrate the substantial impact of nutrition on education and poverty. 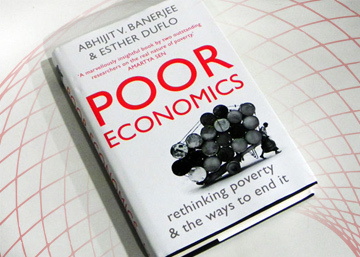 This book as a whole is an important contribution toward understanding the problems of the poorest people in the world. However, as a part of the long–term remedy to poverty, the authors could have discussed in some detail the impact of inequality on poverty. The problem of inequality is now recognized by all economists. It figures prominently in the reports of UN and institutions like World Bank. The facts and figure point out that a small percentage of the richest people mop up most of the resources, income and fruits of development in the world. This shows a serious lacuna in the distribution and sharing of wealth a better distribution and a much more equitable sharing of wealth … and the instruments of wealth like technology… from the rich to the poor can have a substantial and lasting impact on poverty. What is the cause of this unjust and unfair inequality in the world and what can be the lasting solution to type problem? What tis the role of moral and psychological factors like exploitation greed and selfishness in fostering and perpetuating this inequality? Can a higher system of education with an emphasis on the moral and spiritual development of the individual, which can awaken and implant the impulse to share and give on a large scale in the young minds lead to lasting impact on inequality and poverty? Such questions may be beyond the scope of the present book under review. But they have to be discussed and debated by everyone who is interested in finding a lasting solution to the problem of poverty.